Roger Federar was born on the 8th of August, 1981. He is a Swiss Professional tennis player. He held the ATP Number One Rank for 237 consecutive weeks hence creating a record. As of the 4th of July, 2011 Roger Federar World Ranking became World Number 3 by the ATP. He has a men's record of bagging 16 Grand Slam singles titles. He is one of the seven male players to capture the career Grand Slam and one of the three to do it on different surfaces. He is one male player to reach the title match of each Grand Slam atleast five times. He is considered to be the greatest Tennis player of all times by all tennis critics. 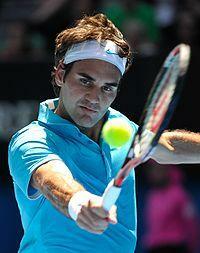 Roger Federar Racquet Brand : He uses a Wilson six, One tour BLX tennis Racquet. Roger Federar Favourite surface: He is a champion on all surfaces and doesnot have any such favourites. Roger Federar started playing tennis at a very young age of six. He loved the sport and kept on playing. He even took a membership at the "Old Boys" tennis club in his hometown. Then from 1991 to 1995, he was trained and was handled by his coach. Roger Federer's coach was Australian Peter Carter. Before playing professional tennis, he became the Swiss Junior Tennis Champion at the age of 14. Two years after that, on july 1996, he became the ITF World Junior Tennis Champion. Roger federar's first tournament as a professional was at Gstaad in 1998 when he was only in his 12th Grade. He won the 2001 Hopman cup representing Switzerland along with Martina Hingis. Roger Federar Grand slam History has been quite great. In 2003 he won his first Grand Slam singles title at Wimbledon. During 2004, Federar won three Grand Slam titles for the first time in his career and became the first person to do it since Mats Wilander in 1988. The first Grand Slam was at the Australian Open, the second the Wimbledon Crown and the third the US Open. In 2005, Federar failed to reach the finals of two grand Slam singles title, losing both Australian Open and French Open. However back on grass he won the Wimbledon titles championship. At the ATP Masters series 1000 he had four wins. Year 2006 was another glorious year for him. He won three Grand Slam singles titles and reached the finals of the last one losing against Nadal in the French Open. This was their first meeting and Roger Federar and Rafael Nadal's Rivalry started from here which continued in the Wimbledon Championships final where Federar defeated Nadal. In 2007, Federar again reache the finals of the four Grand slams winning three of them. In 2008 he won one Grand slam title at the US Open. He was defeated by Nadal in the next two Grand Slams. In doubles Federar and Stanislas Wawrinka won the gold medal at the Olympic Games. In 2009, Federar won two Grand Slam singles titles, which were the French Open and the Wimbledon Championship. He reached the finals of two more grand slams losing to Nadal in the Australian Open. In 2010, Federar continued to reach the milestone of achievements. He won the Australian Open though lost the French Open losing his Number 1 ranking. However in the French Open itself he won his 700th and 150th tour match on clay. At the start of the 2011 season, Federar won the 2011 Qatar Open. But his career started to fall after that. He could not win in any of the Grand Slam except for reaching the finals only of French Open.